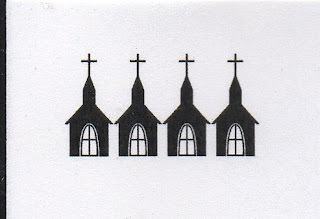 Which is the church in the film: that big building with all the crosses or that long wooden structure where boats unload cargo? 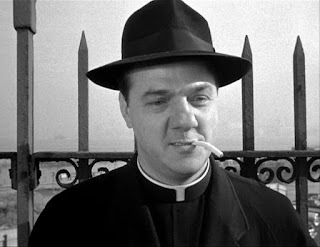 Father Barry (Karl Malden) seems to believe it’s the latter. It's good you’re reading this for a critique of Movie Churches rather than movies, because how much more needs to be said about the film? It won eight out of the twelve Oscars it was nominated for, including Best Picture, Best Director, and Best Actor (for Marlon Brando). It was ranked #8 in the American Film Institute’s list of best American films, and it made the Vatican's best films list as well. So, far be it from me to judge this revered classic -- but I'm more than happy to judge the church and clergy in the film. We first see Father Barry (Karl Malden) at the scene of a murder. He’s trying to comfort a woman (Edie, played by Eva Marie Saint) whose brother was just pushed off the roof of a building. His priestly advice is "Time and faith are great healers." This does not calm her. He then tells her, "I'm in the church if you need me." This also falls short of what Edie needs, and she responds, "You're in the church if I need you? Did you ever hear of a saint hiding in a church?" Father Barry realizes she’s unimpressed by him, and he says, "You think I'm just a gravy train rider with a turned around collar. I see the sisters taught you not to lie." The priest takes what she says to heart and doesn’t hide in the church building. 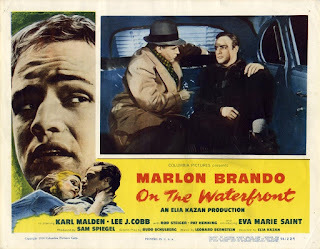 He acknowledges the wharf is his parish and dedicates himself to finding the killer of Edie's brother and to fight the mob that rules the dockworkers’ union. Father Barry invites the men of the docks to meet in the church basement to talk about their concerns. He begins the basement meeting, calling himself "just a potato eater" but someone who wants to get to the truth about the murders on the docks. He asks the men to talk, "How can we call ourselves Christians if we protect these murderers with our silence?" Another priest, Father Gregory, tries to read to the men from the Gospels, but the mob disrupts the meeting and attacks the men in attendance. 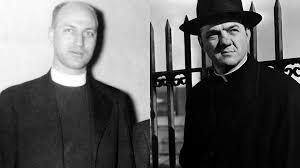 One of the beaten men, Kayo, offers to testify against the mob, and Father Berry promises to stand by him. But Kayo is murdered while working at the docks; crates of whiskey are dropped on him. Father Barry goes to give the man last rites, then stands to preach to the men of the docks: "Some people think the crucifixion only took place on Calvary. They better wise up. These deaths of innocent men are crucifixions as well, and anyone who stays silent shares the guilt of the Roman soldier who pierced our Savior's side. Boys, this is my church. And if you don't think Christ is down here on the waterfront, you've got another guess coming." 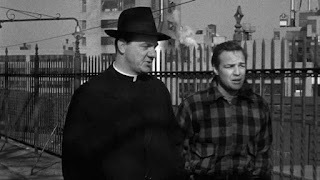 I recently reviewed Angels with Dirty Faces and was rather disappointed in the priest in that film because he neglected his priestly duties in order to fight crime. Father Barry also makes fighting the mob a priority over other priestly duties, but he does so while preaching Christ and Him crucified, which is his primary duty. Father Barry is approached by Terry (Brando), who had a part in Edie's brother's murder. Father Barry doesn't want to hear his confession and tells Terry to go to Father Gregory. (Greg does seem to be taking the bulk of the church chores while Barry is at the dock.) But Barry listens when Terry tells him about his guilt, and he stands by Terry as he takes on the mob. Father Barry knows that Jesus stands by him. So I would stand by him. 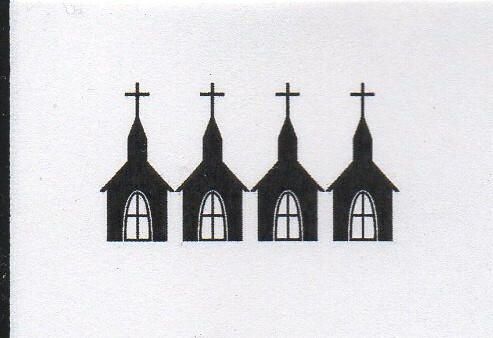 I'm giving Father Barry and his dock church 4 steeples.